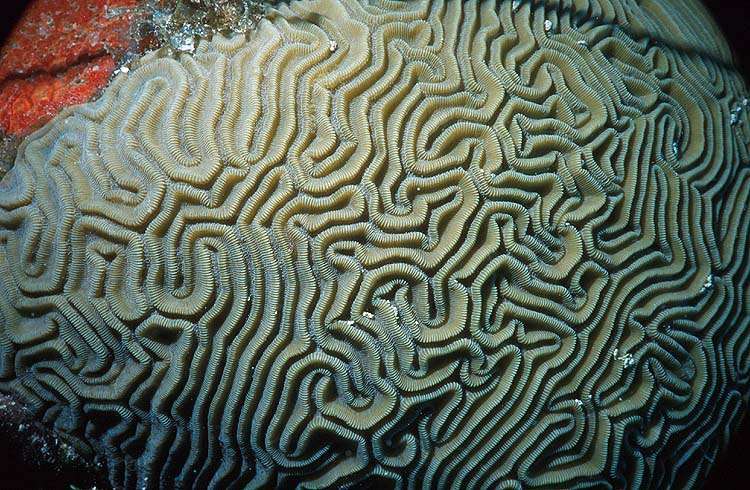 This picture shows a closeup of the surface of a healthy Brain Coral. The Brain Coral is a type of stony coral. It is called a stony coral because these animals build a hard skeleton out of calcium carbonate using minerals the animals get from the ocean water. The surface of this skeleton contains many rough ridges, and the coral animals live in the crevices between these ridges. Individual coral animals are called polyps (say, "PAH-lips"). There may be 200 polyps living on the surface of the coral in this picture. The Brain Coral in this picture is about 8 inches wide. Notice that the ridges are in pairs with a small gap between. The polyps have tiny tentacles that they use to catch food. During the day, the tentacles hide in the tiny grooves on the sides of the ridges for protection. If you look closely you will see small pieces of sand stuck on the surface of the coral. This sand was stirred up by a hurricane that passed through The Bahamas one day before this picture was taken. The coral polyps can push away this sand, and the surface of the coral should be clean again in just a couple of days after a hurricane. Click here to see an Ultra Closeup picture showing the polyps and their tentacles.